Evidence from patient surveys reporting experiences of the three main therapeutic approaches to management of ME/CFS have produced results that differ significantly to that promoted by some healthcare practitioners and claimed by the published research evidence. In 2012 we decided that a new and more detailed patient survey was required that would go further than previous surveys and seek to explain the factors that might contribute to patient-reported outcomes. When large numbers of patients consistently report that currently employed management approaches are not as acceptable, effective, or as safe as has been claimed they ought to be, then we see it as our responsibility to investigate these reports, try to substantiate them, and then lobby for change in respect of clinical recommendations. We hope that this new evidence might persuade the National Institute for Health and Care Excellence (NICE) to improve the current clinical guideline on ME/CFS (CG53), and also provide clearer guidance to NHS specialist services and private health practitioners on ways in which illness management advice can be made more suitable for all those affected by this disease – thus leading to improved patient-reported outcomes. Our survey was launched online in May 2012 and ran until August 2012. It was open to anyone with M.E., chronic fatigue syndrome or post-viral fatigue syndrome. We asked about management courses and self-management that employed CBT, GET or Pacing approaches and we also canvassed the views of those who had not been offered a course, had been refused a course, or had not taken up a course recommendation. The survey was split into three parts – one each for CBT, GET and Pacing – asked 228 questions in total and was completed by 1428 respondents (though not every question was completed by every respondent). The report is concerned with responses from those who had received a positive diagnosis from a health professional, had undertaken one-to-one or group course (whether or not they had fully completed the recommended number of sessions); and had indicated both the severity of their illness before and after their course, and whether or not their course was appropriate to their needs. Of these respondents, 493 had been on a CBT course, 233 on a GET course and 226 on a Pacing course. Some had been on separate courses for more than one therapy, others had been on courses comprising multiple therapies. The report comprises 120 pages of quantitative analysis (looking at the data from various perspectives), 10 pages of conclusions and recommendations and is accompanied by 140 pages of qualitative data (non-numerical data which relates to the written descriptions of respondent’s experiences). We examined the effect delivered courses were deemed to have had on symptoms, illness severity, disability benefits, employment, and education; and we looked at the appropriateness of recommended courses in relation to individual patient need, and the effect CBT has on anxiety, depression and stress. We also considered course availa-bility within the NHS, suitability of session length, reasons why courses were not completed in full, the provision of course information to patients, the impact that NICE Guideline CG53 (2007) has had on delivery, effectiveness of courses delivered by specialists versus non-specialists, and we compared our results against previous patient surveys. With regard to the effect courses had on illness severity, we found that GET resulted in the most significant change with more patients who attended such courses reporting their illness had become even more severe as a result (table 1). 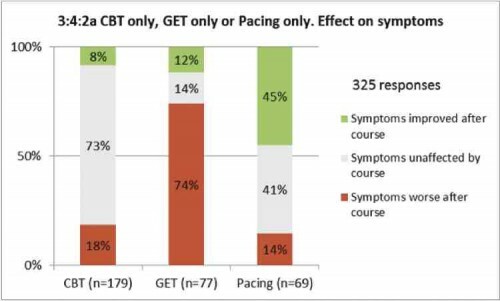 Where patients followed courses that only related to CBT, GET or Pacing; more reported an improvement in symptoms following their Pacing course than did those who attended either of the other courses. 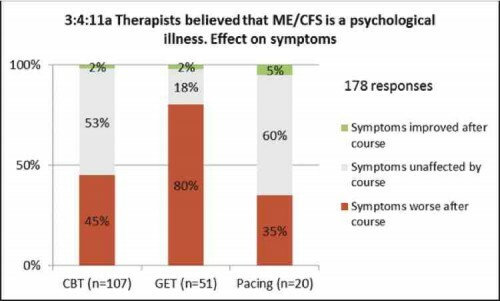 CBT resulted in 91% of participants feeling their ME/CFS symptoms were unaffected or made worse, GET 88%, and Pacing 55%. GET was deemed to have led to a worsening of symptoms by more patients than those who attended either CBT or Pacing courses (graph 3:4:2a). 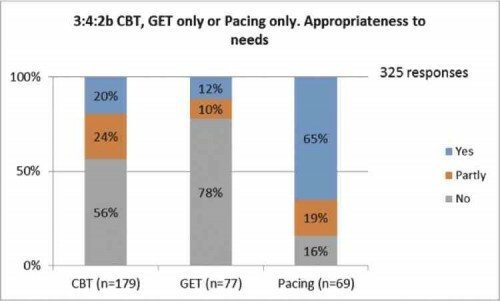 It was clear that the majority of patients attending Pacing courses found this management approach more appropriate to their needs than did those who attended either CBT or GET courses. For a minority, however, GET and CBT courses were appropriate, and pacing was not (graph:3:4:2b). 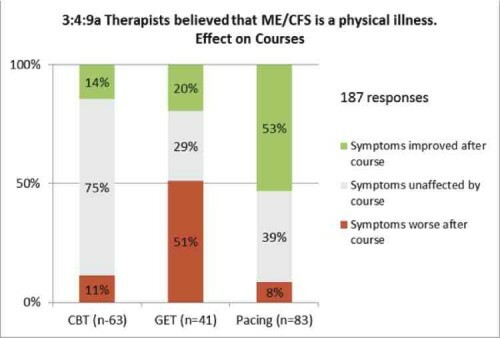 Symptoms were reported as having improved or remaining unaffected by more patients when therapists leading a course recognised ME/CFS to be a physical illness than when therapists believed the illness was psychological. Symptoms were deemed to have been made notably worse when courses were led by therapists holding this psychological belief even for Pacing (graphs 3:4:9a and 3:4:11a). Patients who were not offered or who were refused courses reported the main reason as being that no courses were available in their area. The second reason was judged to be that many patients were considered unlikely to benefit from the offered courses, and also of note was a lack of access to courses and no available home-visit option (table 2). For those who were on benefits, it was most notable that – irrespective of the course undertaken – claims remained largely the same with few reducing or stopping their benefits completely. However, it could be said that net overall increases were seen in benefits following courses in CBT and GET compared to a slight decrease from those attending Pacing courses (table 3). We conclude that CBT in its current delivered form should not be recommended as a primary intervention for people with ME/CFS. CBT courses, based on the model that abnormal beliefs and behaviours are responsible for maintaining the illness, have no role to play in the management of ME/CFS and increase the risk of symptoms becoming worse. The belief of some CBT practitioners that ME/CFS is a psychological illness was the main factor which led to less symptoms improving, less courses being appropriate to needs, more symptoms becoming worse and more courses being seen as inappropriate. Our results indicate that graded exercise therapy should form no part of any activity management advice employed in the delivery of CBT, as this also led to a negative impact on outcomes. There is a clear need for better training among practitioners. The data indicates that deemed lack of knowledge and experience had a direct effect on outcomes and remained a key factor even where courses were held in specialist clinics or otherwise given by therapists with an ME/CFS specialism. However, our results did indicate that when used appropriately the practical coping component of CBT can have a positive effect in helping some patients come to terms with their diagnosis and adapt their lives to best accommodate it. CBT was also seen to have a positive effect in helping some patients deal with comorbid issues – anxiety, depression, stress – which may occur at any time for someone with a long-term disabling illness. An appropriate model of CBT – one that helps patients learn practical coping skills and/or manage co-morbid issues such as those listed above – could be employed, where appropriate, for ME/CFS as it is for other chronic physical illnesses such as multiple sclerosis, Parkinson’s disease, cancer, heart disease, and arthritis etc. ; and we recommend all patients should have access to such courses as well as access to follow-up courses and/or consultations as and when required. We conclude that GET should be withdrawn with immediate effect as a primary intervention for everyone with ME/CFS. One of the main factors that led to patients reporting that GET was inappropriate was the very nature of GET itself, especially when it was used on the basis that there is no underlying physical cause for their symptoms, and that patients are basically ill because of inactivity and deconditioning. A significant number of patients had been given advice on exercise and activity management that was judged harmful with symptoms having become worse or much worse and leading to relapse. And it is worth noting that, despite current NICE recommendations, a significant number of severe-to-very severe patients were recommended GET by practitioners and/or had taken part in GET courses. The other major factor contributing to poor outcomes was the incorrect belief held by some practitioners that ME/CFS is a psychological condition leading to erroneous advice that exercise could overcome the illness if only patients would ‘push through’ worsening symptoms. We recognise that it is impossible for all treatments for a disease to be free from side-effects but, if GET was a licensed medication, we believe the number of people reporting significant adverse effects would lead to a review of its use by regulatory authorities. As a physical exercise-based therapy, GET may be of benefit to a sub-group who come under the ME/CFS umbrella and are able to tolerate regular and progressive increases in some form of aerobic activity, irrespective of their symptoms. However, identifying a patient who could come within that sub-group is problematic and is not possible at present. Some patients indicated that they had been on a course which had a gentle approach of graded activity rather than a more robust and structured approach of graded physical exercise. There were some reports that patients were told they should not exercise when they felt too unwell to do so. These led, for some, to an improvement in symptoms or to symptoms remaining unaffected. However, we conclude that GET, as it is currently being delivered, cannot be regarded as a safe and effective form of treatment for the majority of people with ME/CFS. The fact that many people, including those who consider themselves severely affected, are being referred to specialist services for an intervention that makes them either worse or much worse is clearly unacceptable and in many cases dangerous. GET should therefore be withdrawn by NICE and from NHS specialist services as a ‘one size fits all’ recommended treatment with immediate effect for everyone who has a diagnosis of ME/CFS. This advice should remain until there are reliable methods for determining which people who come under the ME/CFS umbrella are likely to find that GET is a safe and effective form of management. Pacing was consistently shown to be the most effective, safe, acceptable and preferred form of activity management for people with ME/CFS and should therefore be a key component of any illness management programme. The benefit of Pacing may relate to helping people cope and adapt to their illness rather than contributing to a significant improvement in functional status. Learning coping strategies can help make courses more appropriate to needs even if they do not lead to immediate or even longer term improvement in symptoms. For some, improvement may be a slow process so, whilst they may be somewhat better by the end of the course, the improvement is not enough to take them into a better category of severity for some time, perhaps not until they have self-managed their illness for a few years. Pacing can be just as applicable to someone who is severely affected, as to someone who is mildly or moderately affected, although additional measures need to be taken to ensure that a person who is severely affected has equal access to services. However, proposed increases in activity, both mental and physical, must be gradual, flexible and individually tailored to a patient’s ability and circumstance, and not progressively increased regardless of how the patient is responding. There must be better training for practitioners who are to deliver such management courses and all patients should have access to suitable courses, follow-up courses and/or consultations as and when required. We consider the current NICE guideline on ME/CFS with regard to illness management recommendations to be in need of considerable amendment and for NHS specialist services and private practitioners to be advised of more appropriate management methods. We will therefore be preparing a paper on illness management that will better reflect the patient experience using evidence that has been obtained in this report, and in our previous Management Report. This work will also reflect those aspects of the NICE guideline that we feel are supported by patient evidence but have not found their way to delivered patient care. Our paper will detail recommended illness management methods and focus on issues such as a more personalised approach to patient care, improving professional education, course accessibility and home visits, better provision of patient information and shared decision making. We have already made a start on this work and some of our conclusions and recommendations that directly follow on from the results of this survey are presented in part 1 the report. We aim to improve patient reported outcomes with a more encompassing and sympathetic approach to illness management. We are indebted to Ba Stafford for her dedication and commitment to producing this important work together with the other authors and contributors without whom none of this would have been possible: Neil and Mary Riley, Charles Shepherd, Russell Ecob, Simon McGrath and Russell Fleming. A full list of the contributors to the report – too numerous to name here but they gave their time and energy so willingly – will appear in the published report. This report is a big step in the right direction, and I look forward to reading the second part. The recent IOM report which states unequivocally that this illness is not psychiatric, that it is a disease in which exertion of any type ‘may adversely affect many organ systems in the body” also supports the findings in this survey. If we have medical intolerance to anything (lactose, gluten, nuts) it is essential to avoid it. Hence any treatment involving limiting exertion will be helpful, and Ramsay and Acheson stated unequivocally that complete rest from the outset gave the best prognosis. Rest needs to become central to future treatment recommendations. It ios encouraging that, apparently in response to the IOM report, the CDC have already withdrawn their CFS Toolkit, which contained recommendations similar to those of NICE. Hopefully NICE will follow suit, although the power of the psychiatrists in the UK means that they won’t go down without a fight. Thanks to MEA for this massive project. Hooray for this survey and the conclusions that you came to re the importance of pacing . We are each unique and have a different road to travel. Certainly no one size fits all. Interestingly It seems that for some people using the paced activity techniques of Dr. Nancy Klimas in the USA there can be parameters drawn for safe activity using a heart monitor. However all those who I am aware of who have significantly improved their ability to increase their activity levels, have also incorporated a lot of rest where they have lain flat eyes closed in a darkened room. Nancy Blake has some great tips for resting techniques in her book on Amazon. I’m glad I bought it. I am so very grateful to all who helped produce this report, for the work you have done, and for all you intend to do. The statements about current NICE guidelines and therapies offered by the NHS are strong and unequivocal. I do not know what the mechanism is that needs to shift in order to make your recommendations become official guidelines. I don’t know what must happen within the healthcare system, in order to get education of GPs, Rheumatologists and other consultants, and therapists of all kinds geared to make sure they know what this disease is and how to treat patients appropriately. Those of us who are encouraged and hopeful as we read this report might be helped to also know how this system works and can be changed so that we will receive what we need. Would something along those lines be possible for you to write up — attempting to explain what can be done by Dr. Shepherd and the MEA and what must happen in response? Also are there things we patients can do to assist your efforts? I’m currently highlighting the report in various places on the internet. 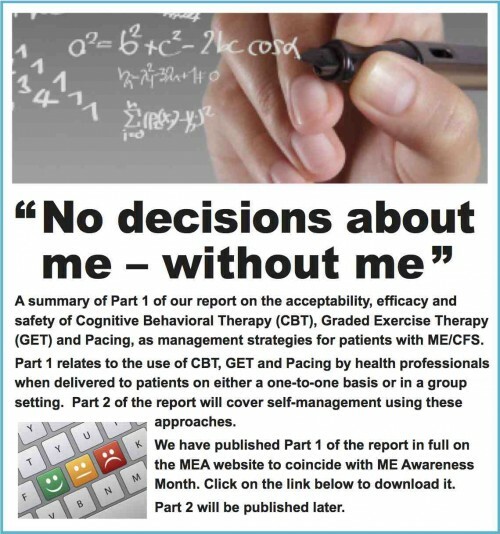 I’ve finally finished reading the 294-page ME Association report that came out in May on the survey results of people who had undertaken courses in cognitive behaviour therapy (CBT) and/or graded exercise therapy (GET) and/or pacing. I found it very interesting and believe it could be a useful resource for some. One doesn’t need to read the whole report. For some, the piece on the ME Association website (that this links to) might be enough. Also the report has a summary at the start. And they consider pages after the first 97 as the appendix. They included some quotes in the first 97 pages but the majority are in the rest of the report. I found it very interesting reading the different issues people had with therapists either in individual or group setting (along with it being interesting to read about some praise being mentioned also). On pages 271-283, there is separately the list of experiences of the effects of CBT, GET and Pacing on employment and ability to attend education. There are (a lot) more negative than positive reports there. These could be useful to have if one was been pressurised e.g. by an employer, insurance company, etc. to do CBT or GET. I thought this might be a good time to plug my published paper, “Reporting of Harms Associated with Graded Exercise Therapy and Cognitive Behavioural Therapy in Myalgic Encephalomyelitis/Chronic Fatigue Syndrome” (from 2011). Part of this involved collating the data from 10 different surveys and discussing issues around them. I also then discuss randomised controlled trials of CBT and GET and how adverse events have generally not been discussed/reported. I have a section on the PACE Trial. The paper is free to read. It took 15 months of on-and-off work for me to do it: it was quite a commitment along with my other activities. It’s around 10,000 words (hard to count with the reference numbers). Possibly a bit academic for some but have received some positive feedback from those who read it. Learn about the benefits of membership and how to join our community. If you would like to support our efforts and ensure we are able to inform, support, advocate and invest in biomedical research, then please donate today. You can download leaflets and buy gifts from our website shop or click the image below for our 8-page order form. 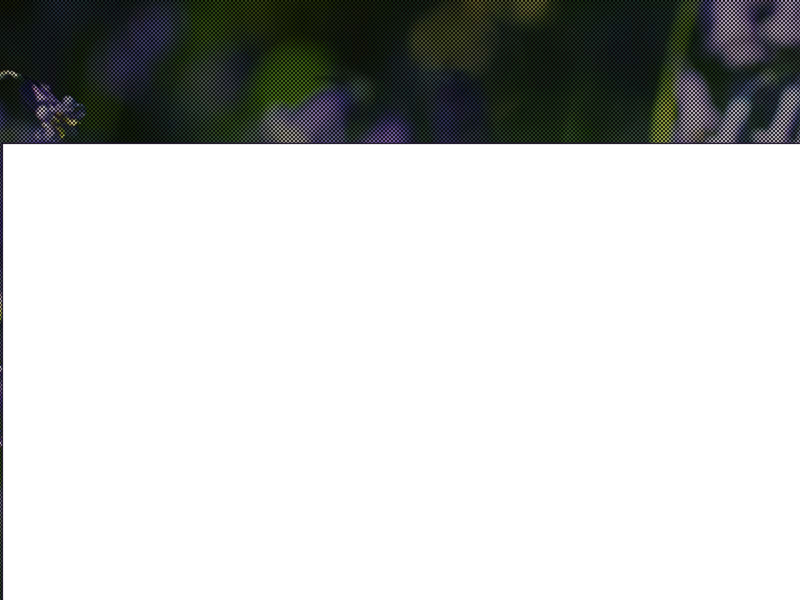 New: ME/CFS Clinical and Research Guide – 2019 Edition! Details of who to contact if you need support or information. Calls cost 7p per minute plus your phone company’s access charge. Calls from mobiles can be considerably more expensive than from a landline.